I made my yearly trip to the Anderson Valley Pinot Noir Festival, May 19-21, 2017, sponsored by the Anderson Valley Winegrowers Association. This year, the event was celebrating twenty years, and was sold out as always. 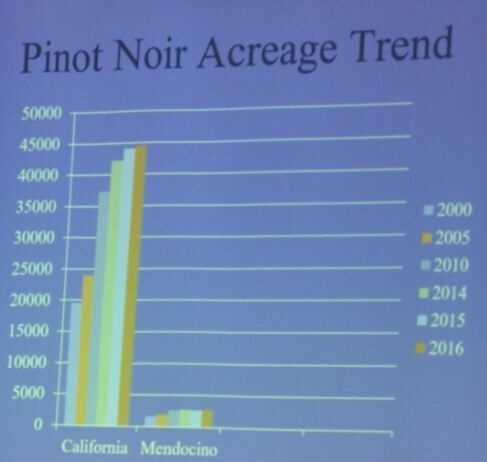 I always look forward to the first presentation of the Technical Conference, “Annual State of Pinot Noir,” prepared by Glenn McGourty, the Winegrowing and Plant Science Advisor for the University of California Cooperative Extension of Mendocino and Lake County. Glenn was traveling, so the presentation was given by Bernaddette Byrne, Executive Director of the Mendocino WineGrowers, Inc.. This talk is always focused on Pinot Noir in Mendocino County and comparison to other Pinot Noir growing regions in California. I have reconfigured all but one slide for easy reading. 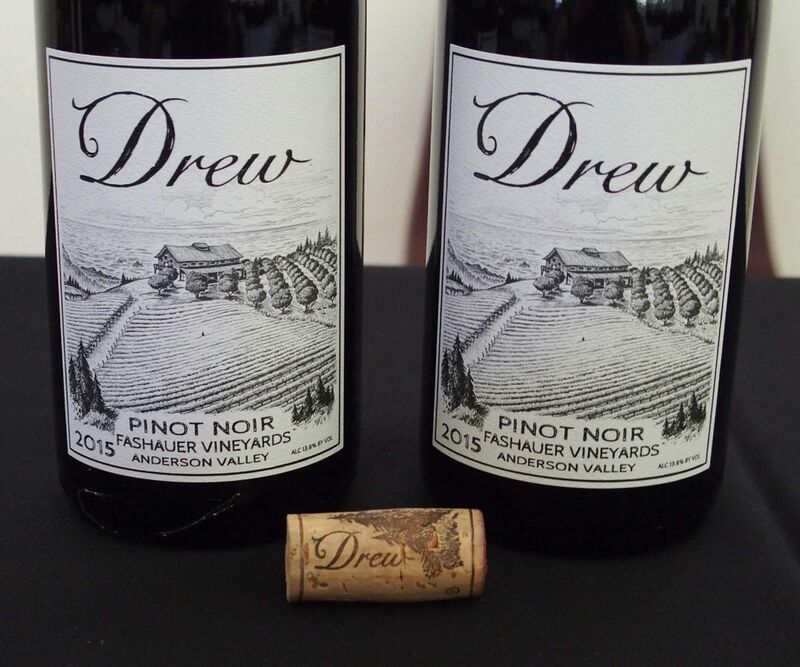 I met up with Jason Drew at his Drew Family Wines Estate in Elk to tour his newer estate vineyard and taste through his 2015 Pinot Noir lineup. Jason has been crafting wine since 1991. 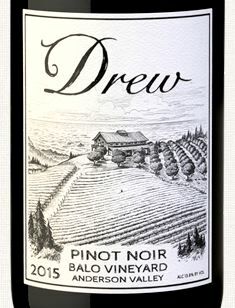 In 2000, he founded the Drew label with his spouse Molly while he was an associate winemaker at Babcock Vineyards & Winery in the Santa Rita Hills. 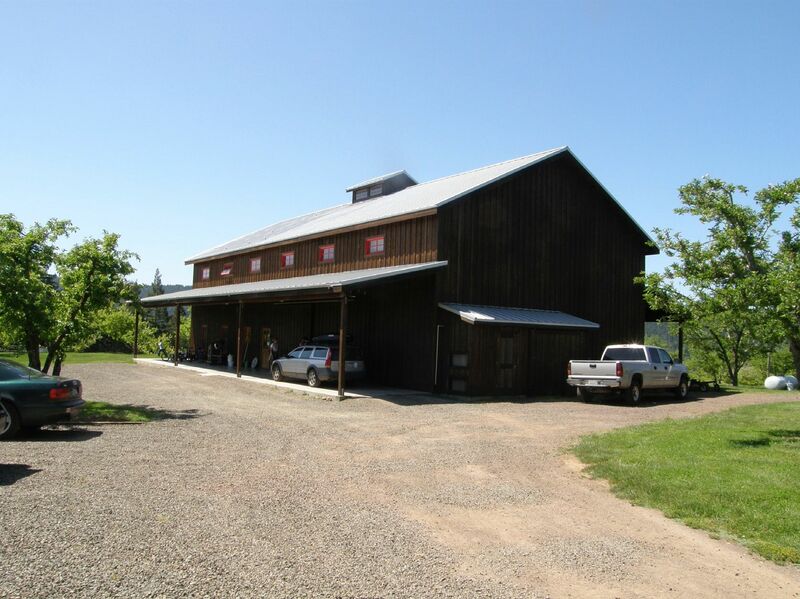 In 2002, he left Babcock to concentrate solely on his own label, and in 2004, he acquired a 25-acre ridge top property in Elk that was a noted, dry-farmed apple orchard. The site overlooks the Anderson Valley to the East and the Pacific Ocean three miles to the West at 1,250 feet elevation in the Mendocino Ridge appellation. A 7.5-acre vineyard was eventually planted (as yet unnamed) and is one of the most westerly vineyards on the North Coast. The soils are ideal ocean floor decomposed sandstone and shale, high in iron and quartzite, with a perfect ratio of sand, gravelly loam and clay. The site’s marginal fertility is combined with excellent water holding capacity and good drainage. Clones planted include Pommard, Dijon 943, 115 and 667, Mt. Eden, and a Swan selection. 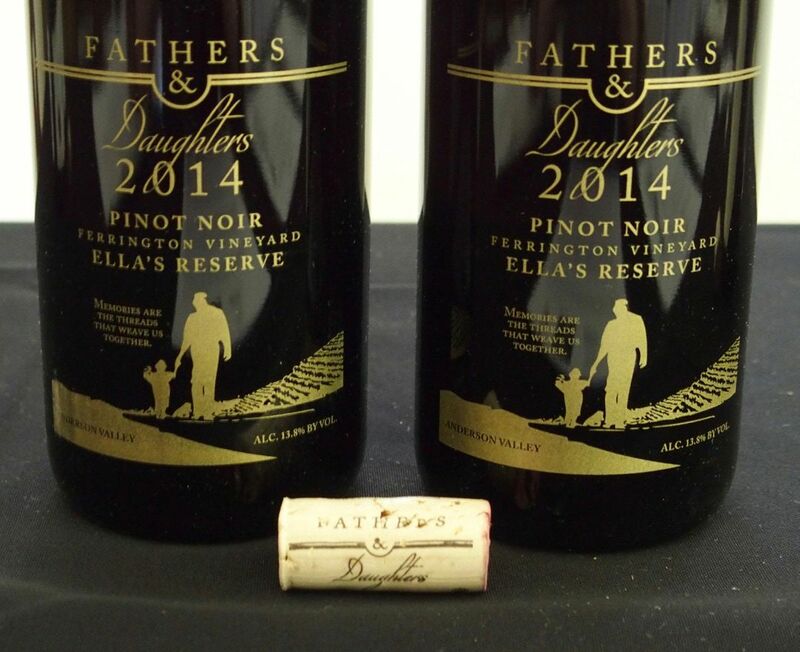 The first Pinot Noir from this vineyard was released from the 2014 vintage. Vineyard sources have changed through the years with new vineyard owners, but Jason continues to seek out the best possible sites that he deems suitable for his style of winemaking. He has sourced fruit from the Anderson Valley, Mendocino Ridge, Sonoma Coast and Yorkville Highlands appellations. 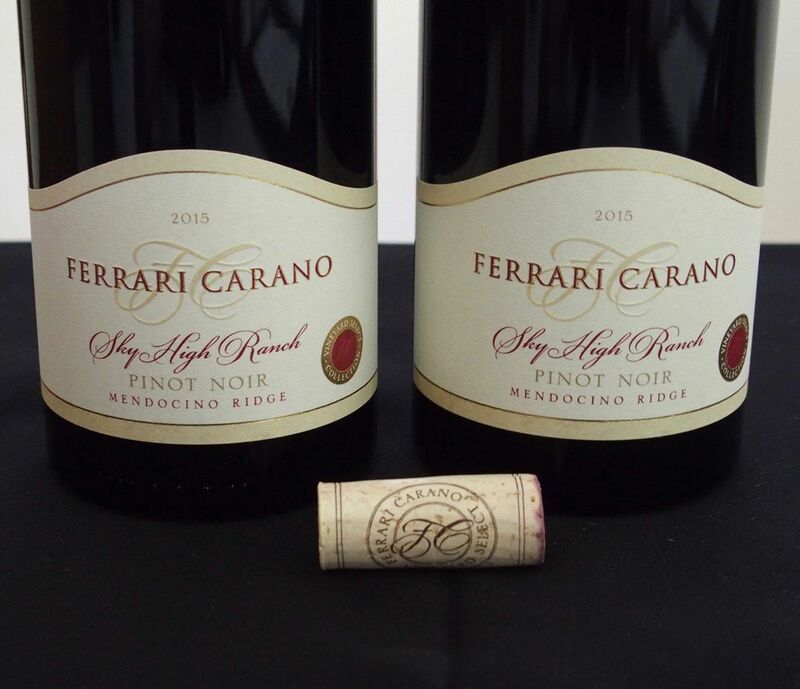 (For a definitive article on the Mendocino Ridge, refer to Volume 8, Issue 9 and Volume 9, Issue 8 of the PinotFile). ,p> Jason vinifies with feral yeasts, employs a variable but usually significant amount of whole cluster inclusion, and ages in about 30% new French oak barrels. Production is 1800-2000 cases per year, increasing with the 2017 vintage to an estimated 2800 cases due to increased fruit from the estate vineyard. Wines are released in February, June and the fall. The Morning Dew Ranch bottling is sold out. 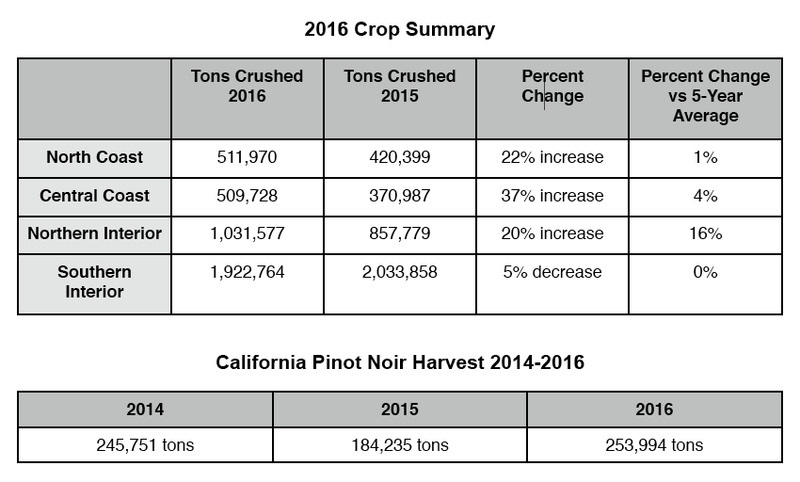 Vintage 2015 offered low yields, with production at some vineyards off 50% or more. The result was small berries with concentrated sap, pronounced acids and increased tannins. The flavors arrived at relatively Brix and trended more red fruit. 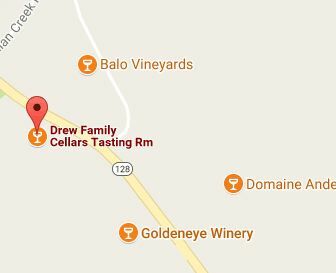 Drew wines are available for tasting at 9000 Hwy 128 in Philo in the Madrones Friday through Monday. The website is www.drewwines.com. To guarantee access to all wines, join the mailing list or the wine club. Rebecca George is the winemaker for Kelly Fleming Wines in Napa Valley, focusing on Cabernet Sauvignon and Sauvignon Blanc. She spent several years working with Burgundian-style wines, including stints at Domaine Meo-Camuzet in Burgundy, and Williams Selyem and Marcassin in Sonoma County. 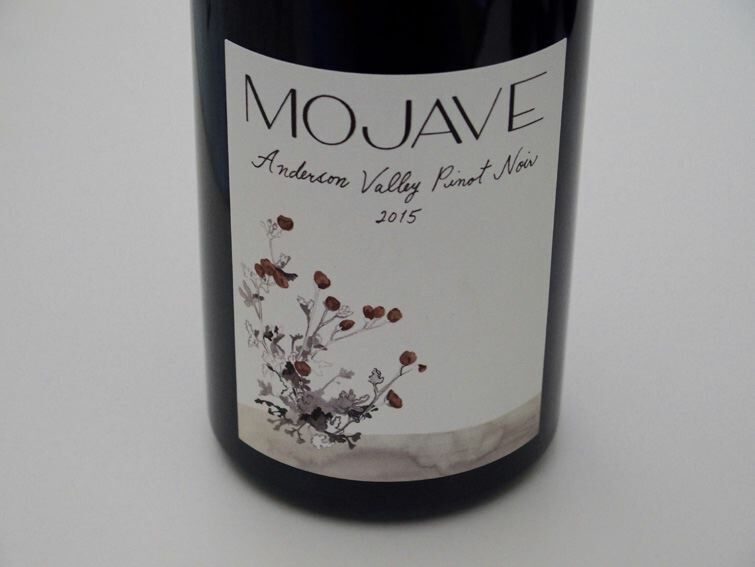 Pinot Noir is her true passion and her focus for her personal label, Mojave. She plans to pursue more cool climate sources for Pinot Noir in the near future. Visit www.mojavewines.com. This winery needs no introduction because it is one of Anderson Valley’s longest tenured wineries. The entire lineup of red and white wines have always been consistently agreeable and often even exceptional, and priced sensibly. Visit www.navarrovineyards.com. In 2005, they began crafting their own Pinot Noir under the guidance of winemakers Scott Shapley and Chris Nelson at Crushpad in San Francisco. 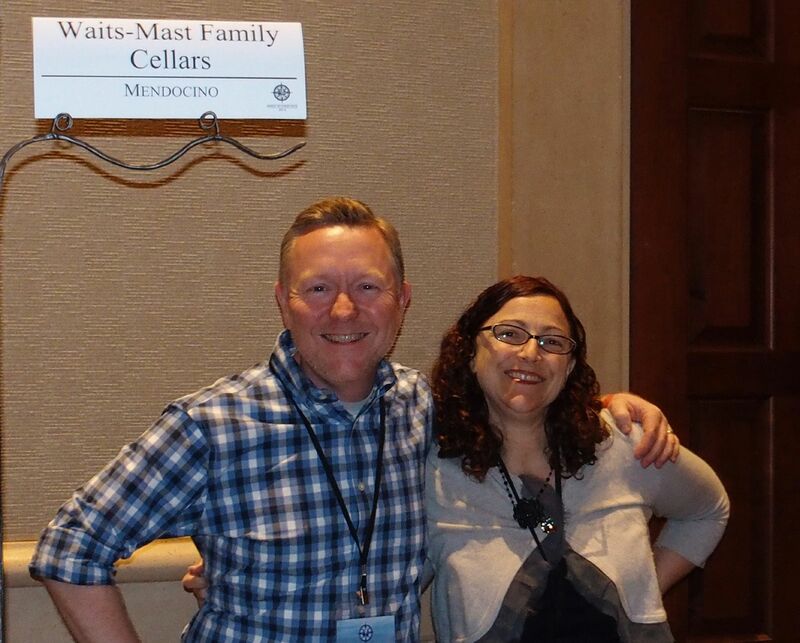 Their early efforts were rewarding, so they launched Waits-Mast Family Cellars in 2007. The Pinot Noirs are usually 100% de-stemmed and fermentation may be native or inoculated. 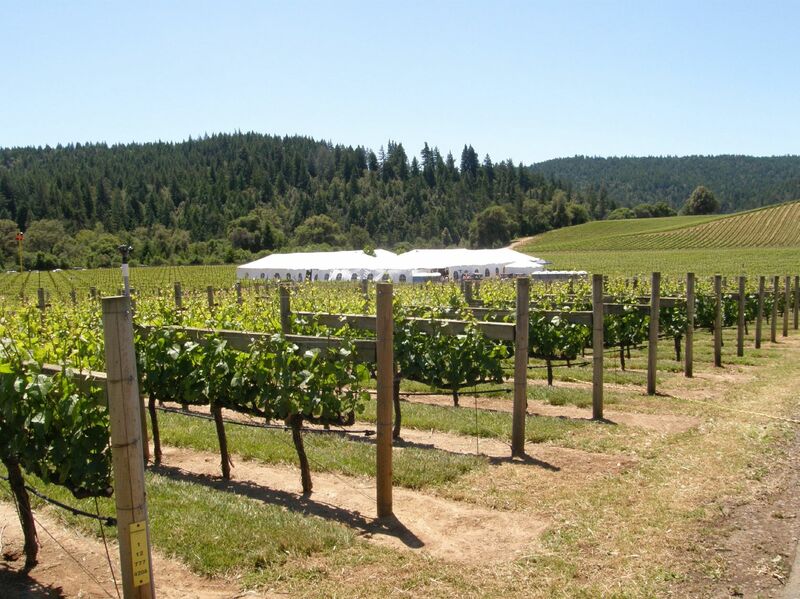 The winery looks to vineyard-designated Pinot Noirs from special vineyards in Mendocino County. Multiple wines are offered that are produced in small 50 to 100-case lots. 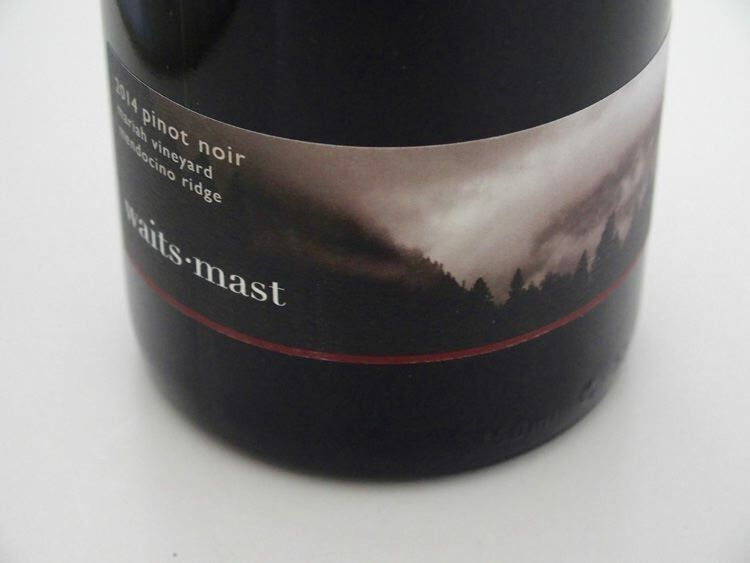 The wines are sold through a mailing list, online through the website at www.waitsmast.com, and through a limited number of fine retailers and restaurants. I believe all the wines reviewed here are still available. She was one of the first female graduates in Fermentation Science at the University of California at Davis in 1978. After working with Richard Arrowood at Chateau St. Jean and Jed Steele at Edmeades, she started her own brand at a time when Mendocino County’s Anderson Valley was largely uncharted and considered by many too cold for growing wine grapes. Along with her late husband, Rex, she chose Anderson Valley because of its rural lifestyle and the chance to follow their own path, somewhat removed from the entrenched winemaking culture elsewhere in California. 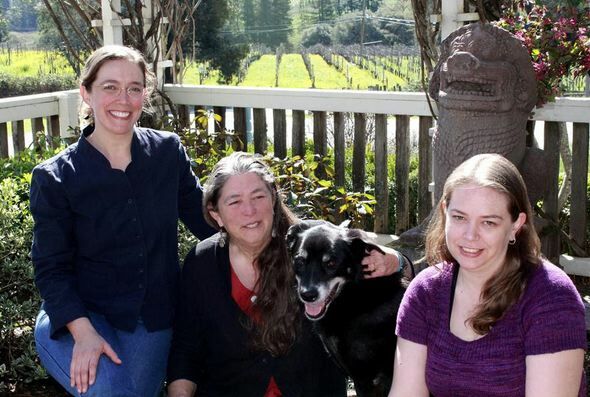 While raising her older daughter Megan, Milla started making wine in the basement of her house and set forth to create her own wine brand. In the 1980s, the California wine industry was experiencing a renaissance with new varietals, new techniques and new standards of wine quality, and she was at the forefront. In 1982, she crafted 250 cases of Chardonnay, becoming the first woman winemaker and owner to establish a wine label with her own name in the United States. She has since served as a role model for women winemakers and entrepreneurs in a highly charged, highly competitive, and male-dominated industry, while always staying true to her art. Milla’s conviction that organic farming helps reveal a wine’s expression of regional and varietal character led her to pursue organic certification for the Handley Estate Vineyard in 2003 (granted in 2005), long before such practices were commonplace. Co-winemaker since 2012, Randy Schock has been promoted from Co-Winemaker to lead Winemaker. He will continue the standard of Handley Cellars wines. The whites, which have been free of animal products since the 2012 vintage, will still be created with minimal intervention. The Pinot Noirs will still have balance, proper acidity and minimal oak influence. In honor of Milla’s retirement, the winery is releasing a 2015 Estate Blanc de Blanc. 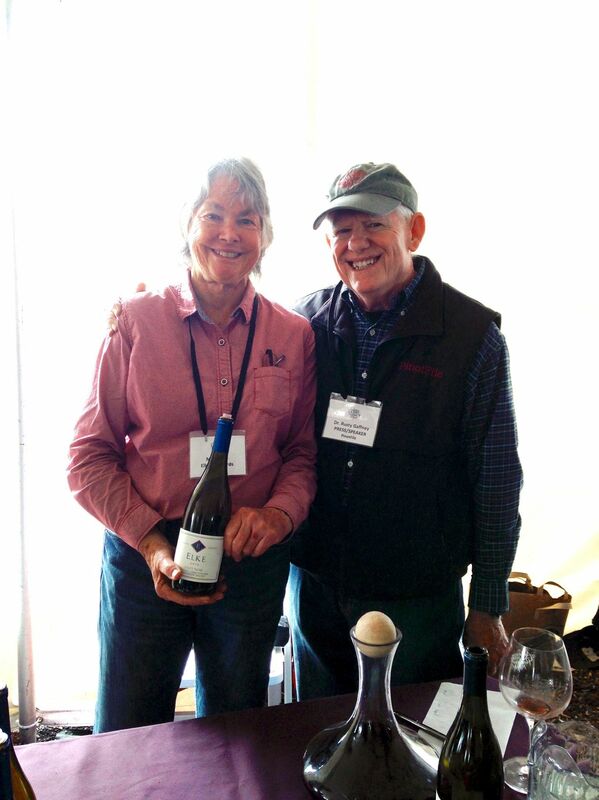 The photo below from my archives shows Milla pouring her wines at an Anderson Valley Pinot Noir Festival Grand Tasting and talking with John Winthrop Haeger, author of North American Pinot Noir. Handley produces small lots of Pinot Noir, Chardonnay, Pinot Gris, Riesling, Gewürztraminer, Syrah, Zinfandel, and sparkling wines. The tasting room, garden courtyard, and folk art gallery on Highway 128 in Philo are open daily. The website is www.handleycellars.com. Mary began her farming career growing organic apples in the Anderson Valley and making Mary Elke Apple Juice. Some people in California still know Mary more for her apple juice than her wine. In recent years she gave up her apple farming but still made her revered apple juice from Jason Drew’s estate in Elk. Unsweetened, with no additives or preservatives, the juice flash pasteurized to preserve the flavors. She began growing wine grapes in the Napa Valley in 1979 and the Anderson Valley in 1990. The 60-acre Donnelly Creek Vineyard, located just east of Boonville at the confluence of Donnelly and Anderson Creeks, has accrued very popular status among pinotphiles. 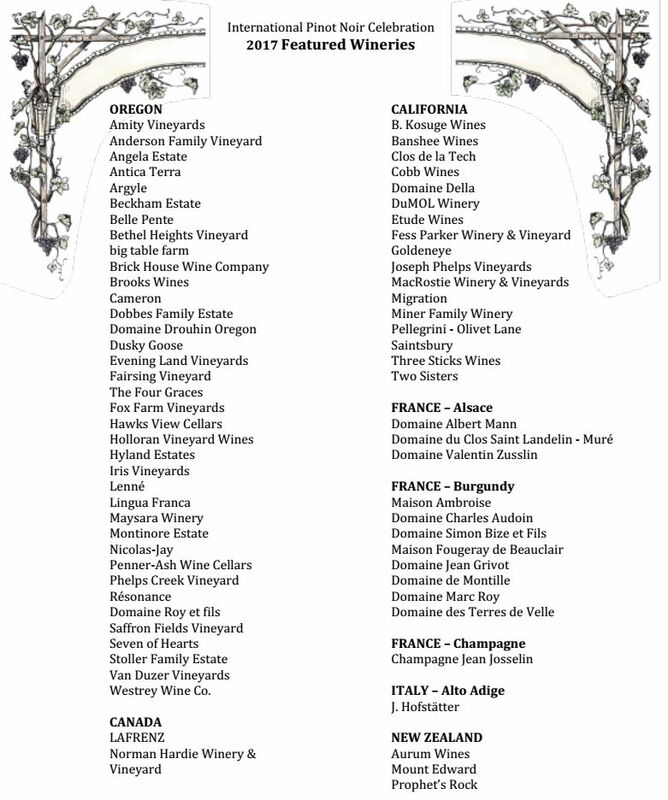 Chances are, you have wines grown by Mary, including Mumm Napa, Roederer Estate, Radio-Coteau, Copain, Londer Vineyards, Au Bon Climat, Mendocino Wine Company, Far Niente, ICI/La BAs, Franciscan, Breggo Cellars, Saintsbury, Goldeneye, Fulcrum On Point, Wilde Farm Wines, Manross Wines, and FEL Wines. In 1997, Mary and her late husband, Tom, started Elke Vineyards, holding back some grapes for Elke wines, most notably Elke Vineyards Blue Diamond Donnelly Creek Vineyard Anderson Valley Pinot Noir. One of her two sons, Matt, manages the family’s home ranch. 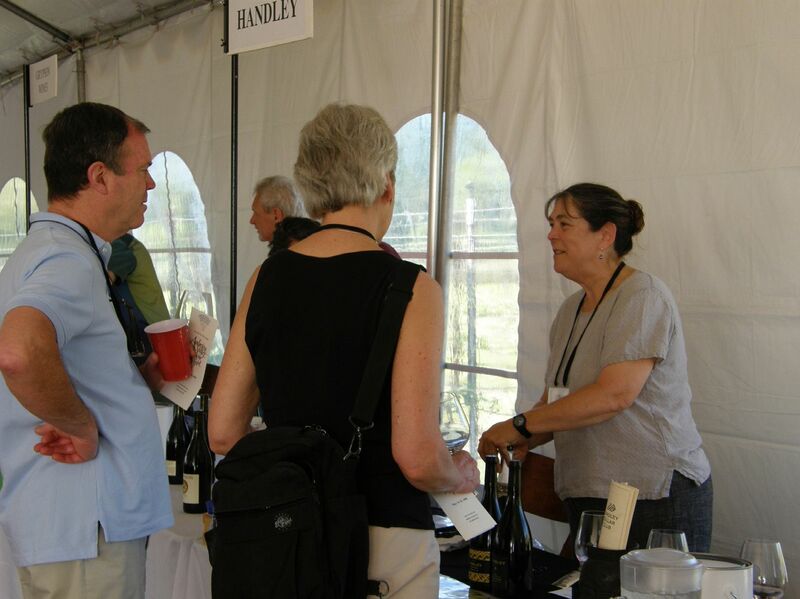 At the recent Anderson Valley Pinot Noir Festival, Mary sold me her last vintage of Donnelly Creek Vineyard Pinot Noir was 2015. She is retiring, and selling off her inventory. Every year she generously shared older vintages of her wines, and they consistently aged beautifully. She represents much of what is good about Anderson Valley people. 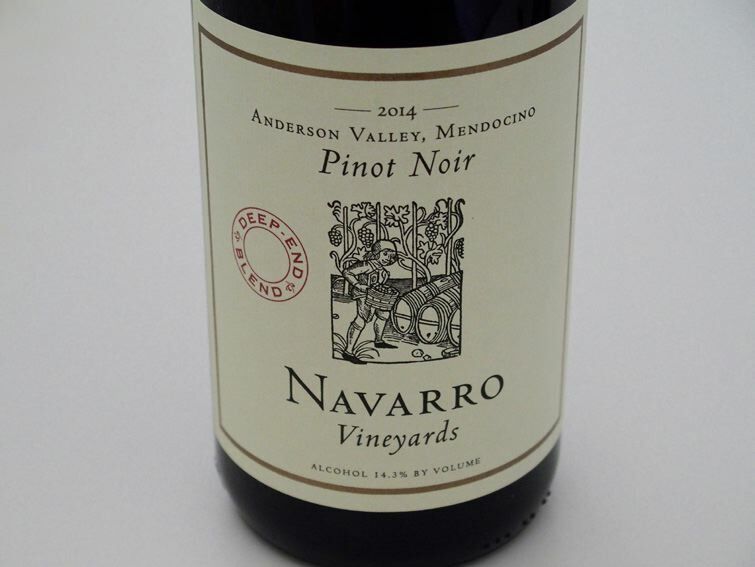 Part farmer, part wine lover, always charming, and a proud and tireless spokesperson for Anderson Valley Pinot Noir. The winery’s website is at www.elkevineyards.com. I am uncertain how long the tasting room will be open. Jeff Hansen has stepped down as winemaker at Lula Cellars, after more than three decades making California wines. The Lula label was named after his grandmother. Jeff will retain the title of Founder and will also serve as Winemaker Emeritus and assist Lula Cellars for special projects, grower development and production tastings. Jeff began his career in wine in 1987 when he worked in the tasting room at Spring Mountain Vineyard in Napa Valley. That same year, he made his first wine at home, a Cabernet Sauvignon, using grapes from Spring Mountain. He soon discovered the Anderson Valley region and fell in love with this ruggedly beautiful area, famed for Pinot Noir. In 1991, Jeff produced his first Anderson Valley wines for Amici Cellars in Calistoga and continued as winemaker for that winery for twenty years. 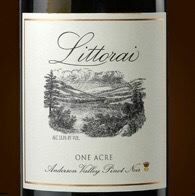 In 2009, he sold his interest in Amici and founded a small lot Anderson Valley winery called Lula Cellars. He opened the winery in 2010 as a tribute to his grandmother’s tenacity and optimism in the face of adversity. She was born in the Oklahoma Territory in 1879 and raised three children by herself while working multiple jobs. Jeff cites her as his inspiration in life. 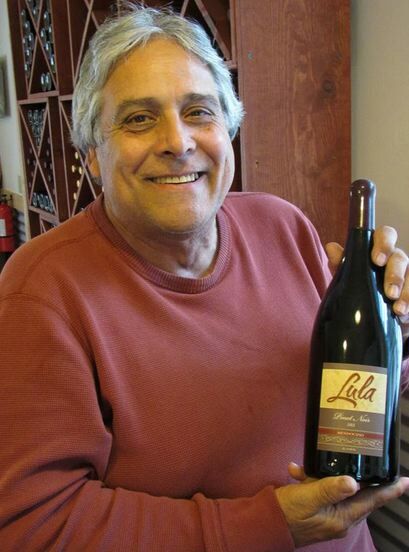 Lula Cellars was lauded from the start and Jeff’s annual production of 2,800 cases of Mendocino County Pinot Noir, Zinfandel, Dry Gewürztraminer, Sauvignon Blanc and Rosato have won loyal fans. The wines have always been sold only directly to consumers. The winery makes its home on a 22-acre property in Philo next door to Handley Vineyards and the tasting room offers a unique experience. The tasting room is open daily. Visit www.lulacellars.com. Gregory V. Jones New Director of Wine Education at Linfield College Gregory V. Jones is known as one of preeminent wine climatologists who focuses his research on how terroir influences wine production. He regularly conducts research for the wine industry in Oregon, was a contributing author to the 2008 Nobel Peace Prize-winning Intergovernmental Panel on Climate Change Report, and has authored many book chapters, reports and articles on wine economics, climate change and climatological assessments of viticultural potential. Jones replaces Ellen Brittan, the founding Director of Wine Education at Linfield. Linfield is the first college in the country to offer an interdisciplinary liberal arts degree in wine studies. It is in the process of developing a wine and sustainable systems major. Benefitting from its location in the heart of Oregon’s Willamette Valley, Linfield also offers wine management and wine marketing certificates online, provides a summer wine-industry immersion program, and annually hosts the International Pinot Noir Celebration each summer. Wine Shipping Update from Tom Wark , Executive Director of NAWR There are still state laws that prevent wine drinkers from receiving wine from out-of-state. 45 states allow wine shipments from out-of-state wineries, but only 14 states allow wine shipments from out-of-state wine stores and retailers. 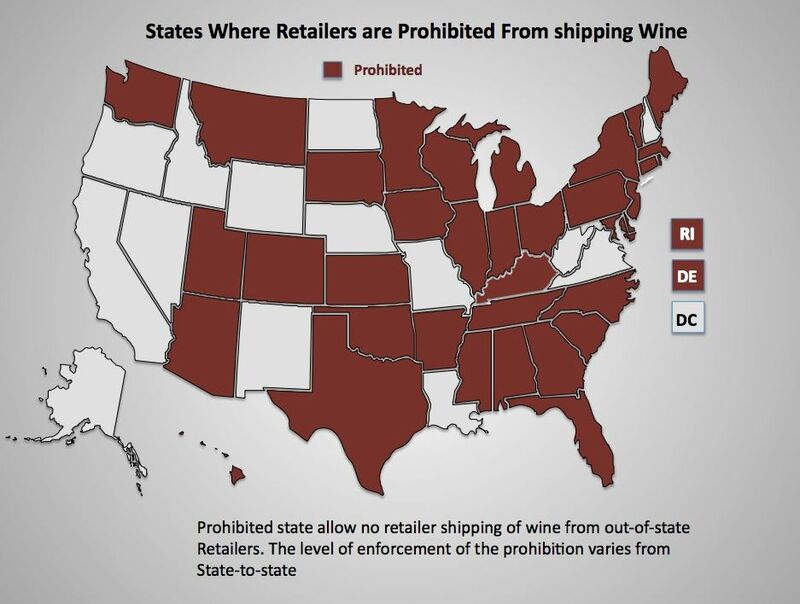 The consequences of bans on retailer-to-consumer wine shipments is that because only retailers are permitted to sell imported wines and when states ban shipments from out-of-state wine retailers, they ban consumers from receiving any shipments of any imported wines. States leave millions of potential tax dollars uncollected by banning shipments from out-of-state retailers. Consumers access to wines is diminished considerably. A website, www.WineFreedom.org, has been established and is supported by the National Association of Wine Retailers (NAWR), consumers and free market advocates. The site provides wine consumers across the US with background on the wine shipping issue and the opportunity to easily contact their state representative and ask for changes to the archaic and protectionist policies that ban consumers and America’s specialty wine retailers from doing business legally. A bill is now in legislation in New York that would create a reciprocal law allowing New York consumers to receive shipments of wine from retailers in states that allow shipments of wine from New York retailers. Those living in New York may want to get involved by sending letters to their state representatives. New Study of Health Benefits of Alcohol The National Institutes of Health is embarking on a $100 million clinical trial to study the risks and benefits of alcohol. The research is being funded by five large alcoholic beverage manufacturers which raises eyebrows among those who point out that industry-sponsored research almost always sheds a favorable light on the research outcome for the sponsors. New Book on Grape Health Benefits This review of the current science linking the consumption of grapes to better health is titled, Grapes and Health: A Monograph. The book is directed at health and science professionals and discusses peer-reviewed grape-specific research. It is not a book on grape-based alcoholic beverages per se. There are already approximately 830 registered attendees for the 2017 IPNC weekend, including 140 representatives from the 72 featured wineries. A few Full IPNC Weekend tickets are still available. Held on the beautiful campus of Linfield College in McMinnville, Oregon, the IPNC offers Full Weekend guests three days of tastings, seminars, vineyard tours and gourmet meals. Pinotphiles revel in this joyous, ultimate Pinot Noir lover’s event featuring plenty of Pinot Noir and unpretentious camaraderie. 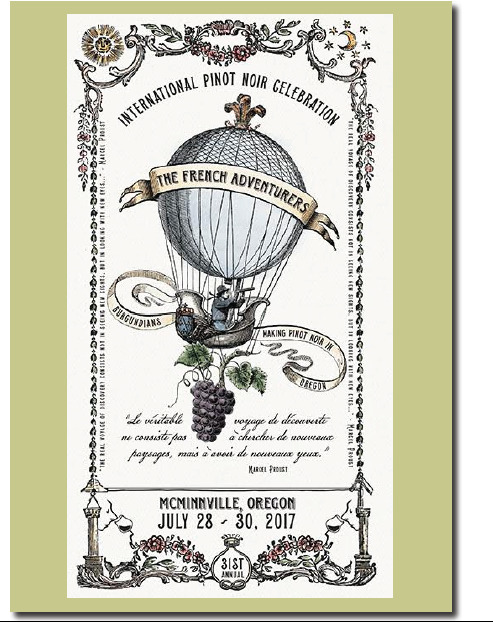 The 2017 IPNC Full Weekend Ticket includes: 2 Grand Outdoor Tastings, Numerous Weekend Seminars, Friday Night Grand Dinner and Saturday Night Salmon Bake, A Vineyard Tour and Winery Lunch, An afternoon University of Pinot Course, An Array of Wine Related Activities and Small Format Tastings, Friday and Saturday breakfast on the patio, Sunday Sparkling Brunch Finale, and the opportunity to celebrate with renowned international Pinot Noir winemakers and sixty Northwest chefs and the chance to taste over 250 Pinot Noirs. Allen Meadows of Burghound.com will be the Master of Ceremonies. The Grand Seminar will be moderated by Eric Asimov of The New York Times, featuring Oregon wines made by visionary French winemakers Véronique Boss-Drouhin, Dominque Lafon, Jacques Lardière, Jean-Nicolas Méo, and Alexandrine Roy. James Beard Award winner and Portland food legend, Vitaly Paley of Headwaters at the Heathman Hotel will prepare the main course for the Grand Dinner. 2017 James Beard Foundation Best Chef Northwest winners Greg Denton and Gabrielle Quiñónez-Denton of Superbite and Ox are preparing bites and disches for this year’s guests. 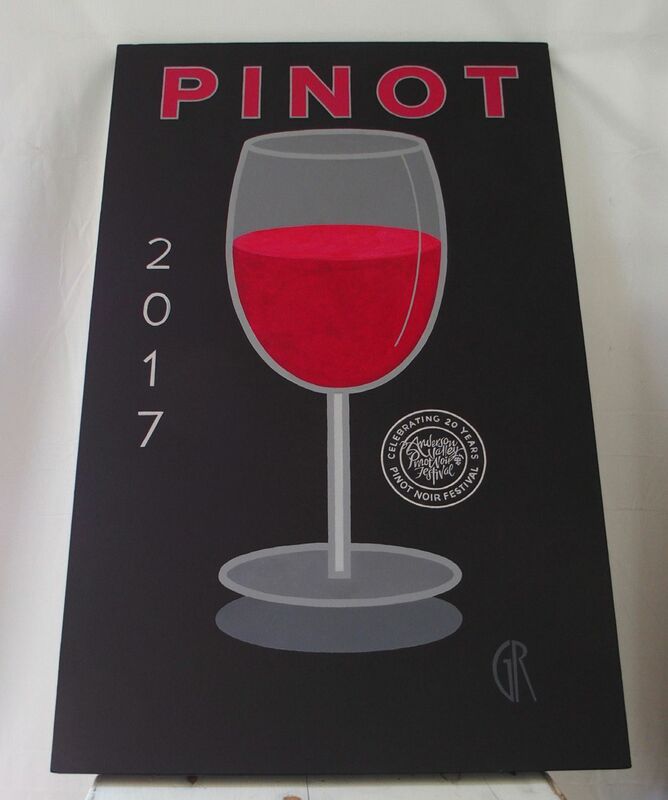 The University of Pinot course offerings can be viewed at www.ipnc.org/university-of-pinot-2017/. To register as a guest for the 2017 IPNC Full Weekend, visit www.ipnc.org. Non-refundable tickets are now $1,295.00. For questions, call 800-775-4762.